The Magical Realm is proud to announce that David Dixon will be a beneficiary of the Magical Realm this year! Many in the Renaissance community know of him as Friar Finnegan. He has a very popular show he performs at Renaissance faires across the country. However, the Magical Realm, along with his friends and family, want him to be more than just kept alive, we want him to be able to live out the rest of his life without this darkness hanging over his head. So it is our goal to help bring a little bit of magic into Friar Finnegan’s life and raise as much of that $20,000 as we can, to aid him in paying off those debts. So how can you help him? There are several ways… You can come and join us at the Magical Realm, June 1st & 2nd at the Eaton County Fairgrounds. If you cannot make it to the faire but want to help, you can donate here on our website. Even a few dollars will help to give the Friar the life he deserves. Other ways to help are to Like and Follow our page, Love and share our posts, and help us spread the word. Or, Volunteer to help in the Magical Realm. 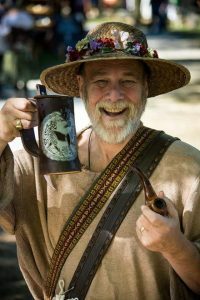 Furthermore, we are proud to announce that Friar Finnegan will be preforming for us at the Magical Realm, so don’t miss this chance to come a see the Friar live and perhaps we can all talk him into doing his naughty show for us in our Mead Hall, the Drunken Dragon!